Time for the regular beauty favorites post! This summer, Vichy presented three great mineral face masks on the Bulgarian market. The first is Quenching Mineral Mask – a mineral gel mask with vitamin B3 and Vichy thermal water. The soothing mask has an “awakening” skin effect. Light and super pleasant, it leaves my skin smooth, soft and refreshed. It is also suitable for sensitive skin lacking hydration. 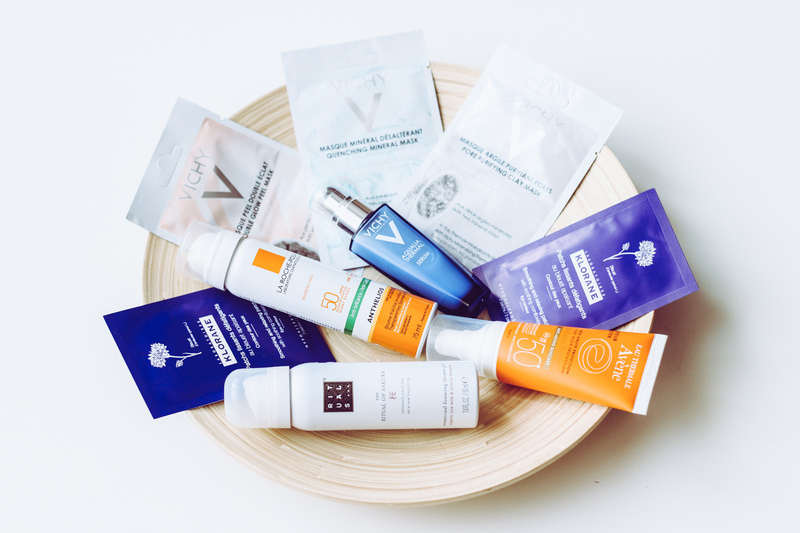 I have always been a great fan of peeling masks, so I was super happy to find out Vichy created the delicate Double Glow Peel Mask with exfoliating effect. The mask is a great combination of AHA fruit acid and volcanic rocks. When washing it off, delicate exfoliating particles remove the dead cells and leave it clean and smooth. And here is my favorite mask! The Pore-Purifying Clay Mask. Thick and super soft, spread as a thin layer, the mask is the spa experience I need. The ingredients Kaolin and Bentonin are known to absorb excess secretion properties and the Aloe Vera extract has a soothing effect. The best of all is that it is super easy to wash off after drying – it is easily removed only with a sponge. I LOVE it! I love all Rituals products and especially their Japanese cherry and rice milk scented ones! The small and convenient bottle of the shower foam The Ritual Of Sakura has a super light and gentle consistency, the foam is formed while you press it in your hand, so you will not need a sponge. It smells great and leaves the skin silky smooth. The only downside is that there is a risk that you will run out of it quickly and you can only buy it online. Anthelios is the face and body sunscreen spray that has been popular with all bloggers lately, and we are no exception. The super-handy, lightweight matting spray with the optimum sun protection of SPF 50+ is the perfect solution against the strong summer sun. I like it because of its fast-absorbing properties, lack of intrusive smell or shine. After spraying I forget that I wear a sunscreen product. The spray bottle is super comfortable and fits in almost every handbag. I totally recommend it! The moisturizing care that everybody needs, the renewed Aqualia Thermal Vichy serum with thermal water has a very light and pleasant texture. Due to the hot weather lately, I only use the serum without applying cream afterward. But what is the difference between a serum and a cream? The cream is a supportive, usually thicker product for daily care, while the serum is more ethereal and light, has a quickly visible effect due to the saturated amount of active substances in its composition and is recommended to be used every 2-3 days. With this in mind, the action of Vichy Aqualia Thermal Serum is almost instantaneous, you get the feeling of well-hydrated and refreshed skin with a healthy look. If you are looking for lightness and hydration, this is the right choice. For those of you who already worry about first wrinkles, I’m sharing the Avene Anti-Ageing Sunscreen SPF50+ with active ingredients against signs of aging. I was curious to try it because I had not met the combination of sunscreen and active cream against harmful sun rays until now. Here the active ingredient is the patented Avène SunSitive complex that protects the skin and stimulates the natural production of collagen. We all know the best anti-aging care starts with minimal exposure to the sun. However, if you need the sun to feel happy, take care of your skin with a product like this one. It is waterproof and does not make the skin unnecessarily greasy. I am super impressed with Klorane’s Smoothing and Relaxing Patches with Soothing Cornflower! I do not often use such active care because I have no problem with puffy eyes. The fact is, however, that dark circles are always there. So I decided to test these patches and the effect was just WOW! After only 10 minutes of use, the skin around my eyes was super-relaxed by the pleasant icy touch of the patches, it was brighter and lighter. I did not suspect that such a product could have such a rapid and strong impact on the eye contour without causing allergic reactions or discomfort. The patches have a great effect thanks to the soothing ingredients cornflower and arnica. It’s been a difficult day but you have to go out tonight? Take the patches out of the fridge, let them work for 20 minutes and you are saved!